Max Streicher is a sculptor and installation artist from Toronto. Since 1991 he has worked extensively with kinetic inflatable forms. He has exhibited his work across Canada in numerous public galleries and artist-run centres. He has completed several site-related projects, most recently in Venice, Siena, Stockholm and Erfurt, Germany. He was a founding member of the Nethermind collective of artists which organized four large exhibitions in alternative spaces in Toronto between 1991 and 1995. 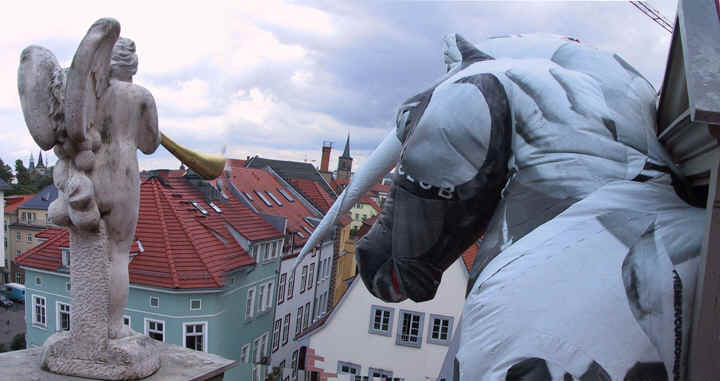 Max Streicher, Stuck Unicorn, Vinyl (recycled billboard), 5 x 6 x 2m, Kunsthalle Erfurt, Erfurt Germany, 2003.